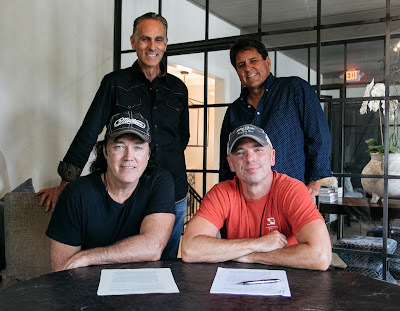 Platinum-selling country artist and prolific songwriter David Lee Murphy returns to recording with Reviver Entertainment Group. The man who defined country’s freewheeling spirit with the #1 “Dust on the Bottle” and Most Played Song of 1995 “Party Crowd” will release No Zip Code on Reviver Records. Produced by 8-time Entertainer of the Year Kenny Chesney and Buddy Cannon, No Zip Code features Murphy’s sweeping post modern country: a little bit redneck, a little bit romantic, a little bit real life. Having written hits for many of today’s biggest stars, Murphy now sings his own songs. No Zip Code will be his fifth studio album and the first album on Reviver Records for Murphy who, in a addition to his own career as a recording artist, has written more than 50 cuts, including chart-toppers for Jason Aldean (“Big Green Tractor,” “The Only Way I Know”), Blake Shelton (“The More I Drink”), Gary Allan (“A Feelin’ Like That”), Jake Owens (“Anywhere With You”), Eli Young Band (“Always the Love Songs”), Thompson Square (the Grammy-nominated “Are You Gonna Kiss Me (Or Not)") and Chesney (“Livin’ In Fast Forward,” “Pirate Flag”). In addition, he’s penned significant album cuts for Thomas Rhett, Luke Bryan, Florida Georgia Line, Brooks & Dunn, Brad Paisley, Montgomery Gentry, Reba McEntire, and Keith Urban.